◊ According to strict Saxon rule*, Stollen should not be cut open before Christmas eve – 24 December. Modern practice is somewhat lenient, however, and it is now acceptable to start eating Stollen on the first of advent (four Sundays before Christmas). ◊ Stollen should never be eaten with a knife and fork – not even a dessert fork. It should be savored by breaking off little pieces with your fingers. ◊ The best beverage to accompany Stollen is a good cup of coffee, possibly tea, but never wine or champagne, for which Stollen would be too sweet. ◊ Stollen should be cellar-cool when eaten, presented on a simple wooden board, and cut with a sharp, unserrated knife. 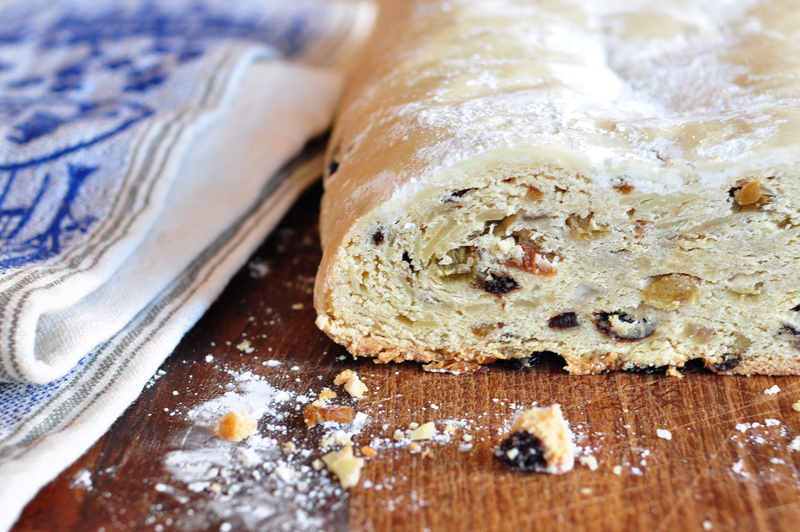 Like many Christmas cakes and cookies, Stollen should be made a few weeks in advance. Place a large bowl with the flour in a warm spot until the flour feels warm to the touch. Crumble the yeast with 1 Tbsp sugar; stir and watch as the mixture becomes liquid. Melt the butter on a small flame, remove from heat, and add the cold milk. Shape a well in the flour. Pour the remaining 1/2 cup of sugar, lemon zest, salt, and vanilla extract into the well, add the milk/butter mixture and the prepared yeast. With a large wooden spoon, mix the wet ingredients into the flour using circular movements. Once the dough starts to detach itself from the sides of the bowl, beat with the wooden spoon for 10 minutes. Chop the candied citrus peel and sprinkle with the rum and almond extract. Knead the almonds, raisins, currants, and candied citrus into the dough. Shape into a ball, cover with a slightly damp cloth, find a warm spot in the house and let rise until the dough has approximately doubled in size, 2 to 3 hours depending on room temperature. Divide the dough in two and roll out each half into an oval approximately 1 inch (2.5 cm) thick. Fold oval in half lengthwise, place on a buttered parchment paper on a baking sheet and let rise again for 45 minutes to 1 hour. Bake the Stollen for 45 to 50 minutes, or until the outside begins to harden but before it starts to brown. Remove from the oven and immediately prepare the sugar crust. In a small saucepan, melt the butter over medium heat. With a food brush, cover the Stollen with a layer of melted butter. Using a small sieve, sprinkle generously with confectioners’ sugar. Repeat this process 2 or 3 times to form the crust. Wrap immediately. To store the Stollen, wrap in parchment paper then tightly seal with aluminum foil and keep in a cool dry place. Never wrap Stollen in plastic. A large tin box would be ideal. This entry was posted on 9 December 2010 at 14:28 and is filed under Breakfast, Christmas, Holidays, Winter. You can follow any responses to this entry through the RSS 2.0 feed. You can skip to the end and leave a response. Pinging is currently not allowed. I want to add this. I rarely drink coffee. I did with stollen and it makes the perfect match. This stollen was superbly delicious. And as we say every year: the best ever!